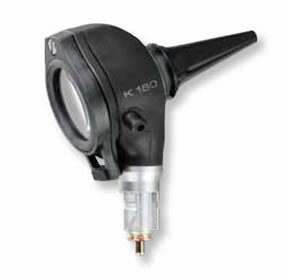 Otoscope with Fiber Optic (F.O.) illumination constructed of light, high-impact polycarbonate and 3x magnification scratch resistant acrylic viewing window. Otherwise technically identical to the BETA 200 F.O. Otoscope. High tech materials, the latest production processes and innovative design are three factors which contribute to the excellent quality of HEINE Otoscopes. They produce excellent image quality with uniquely bright and reflex-free illumination of the tympanum and auditory canal. HEINE Otoscopes are available for various applications with distal fiber optic (F.O.) or direct bulb illumination with bright HEINE XHL® Xenon halogen bulbs.